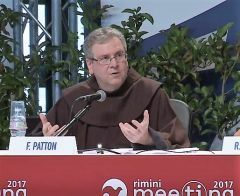 home / Multimedia / The Holy Land in videos / At the Rimini Meeting to discuss the 800 years of Franciscan .. The Holy Land arrives in Rimini. The occasion is the week of meetings and culture that the Catholic Communion and Liberation movement organizes at the end of August each year in Rimini, in Northern Italy. At the Rimini Meeting on August 20, the Custos of the Holy Land, Fr. Francesco Patton, spoke to a crowd about the 800 years of Franciscan presence in the Holy Land. The opening of the exhibit with the theme of “The Land Beloved of God: The Custody of the Holy Land” was also inaugurated on the occasion of this meeting. The common theme of the week was “What you inherit from your fathers, earn it again so as to possess it,” said Fr. Patton. “The theme intends to bring the need to combine the memory of the past with personal responsibility for the present, which is also a way to make a contribution toward building of a different future.” And the photographic images of the exhibit refer to memory, but the eight-century Franciscan presence in the Holy Land is also related to memory, explained the Custos. “Our presence in the Holy Land is primarily related to staying in those places of memory that are sanctuaries,” continued Patton. “Today we keep about 70 shrines and live in 50 of them. This is our way of being friars minor, and therefore it is a way of giving praise to God in the liturgy.” It should not be forgotten, however, that the history of the Franciscan presence in the Holy Land is also a history of ecumenical and interreligious dialogue, which was possible eight centuries ago and which lasted for eight hundred years… Dialogue is never easy but it is necessary,” said the Custos. The discussion moderator was Roberto Fontolan, Director of the International Center for Communion and Liberation, who asked the Custos how the Holy Land has impacted him personally. “As a pilgrim in 1994 I was impressed by the Holy Sepulcher and by Mount Tabor,” replied Patton. “Last year, however, I became more aware of the complexity and the charm of this land.” In order to experience this complexity, Fr. Francis emphasized the importance of dialogue that happens through [both] small and lage encounters with Muslims and Jews and with all of the realities that are present. After the Custos of the Holy Land spoke, many chose to visit the Custody’s Exhibit, which will be on display at the meetinguntil Saturday, August 26. After that date, it will published on the pages of the catalog by Edizioni Terra Santa, and it will be sold in Rimini. A video from the Terra Sancta Museum tells visitors about the history of ancient Jerusalem, while photos of the Custody’s archives demonstrate the legacy left by today’s friars. The exhibit was co-ordinated by Br. Stéphane Milovitch, who is in charge of the Custody’s Cultural Heritage office, by Sara Cibin, the project manager at the Terra Sancta Museum, and by Marie Armelle Beaulieu, director of Terre Sainte Magazine’s photographic archives. The exhibit was possible thanks to the collaboration of ATS Pro Terra Sancta and the scientific contribution of the Studium Biblicum Franciscanum.